As the capital of France, Paris is also its largest city, with over two million people living in the city proper, and in excess of 11 million people in the greater Metropolitan area. Whether you are planning a trip to Paris, or simply like to know more about the City of Lights, Paris for beginners offers information that we hope will prove both useful and interesting. You could start out by reading about the history of Paris, then take a brief tour of its twenty neighborhoods (the so-called "arrondissements"). Next, discover some of the best places for sightseeing, and find out what may be the best form of transportation to get there. If it is culture you are after, check out some of the museums in Paris, the festivals and events, or other forms of entertainment. Of course, there are other, perhaps more mundane ways to have a great time in Paris —you could go shopping, or enjoy the restaurants, cafés and nightlife in this vibrant city. 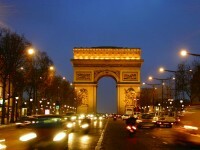 Since you will need a place to stay, we have also included a section on a few hotels in Paris. And finally, we have some tips for travellers who are visiting with kids, as well as some interesting facts and trivia and links to additional resources. Bon séjour, enjoy your stay! Copyright © 2004-2018 M. Feenstra, Den Haag. All rights reserved.